After the phenomenal sell-out success of the Models Own BEETLEJUICE range, growing demands for a Spring Summer update have been answered with three brand-new beautiful shades added to this optically intriguing, multi-tonal collection. The three NEW Beetlejuice polishes are inspired by the colours of a hot summer haze, mimicking a mirage of complex colour-shifting shades to produce these shimmering duo chrome colours. Each bottle contains four pearlescent colours mixed into one gleaming polish for an optimum high finish. Launching online and in Boots from March and also in a unique box set available only at Models Own’s new Westfield Bottleshop opening in April, the collection consists of three brand new shades – Copper Pot, a deep olive tan; Tropical Sun, a glistening sunset and Indian Ocean, a calming iridescent blue with soft pink undertones. Designed to compliment any outfit, Models Own’s latest collection is the perfect accessory for the spring/summer wardrobe, offering unique colour combinations that are all ultra wearable. 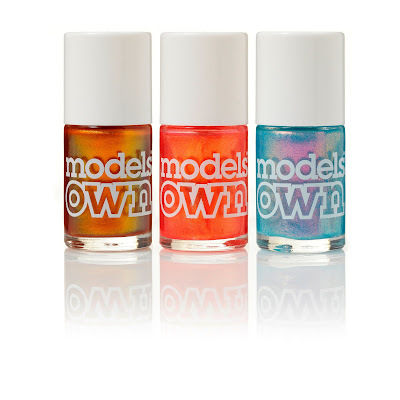 Passionate about fashion, Models Own aren’t shy when it comes to innovative colour. In fact, they’re famous and loved for producing the best ‘of the moment shades’. These latest additions to the Beetlejuice range prove just that. Now only if we could all see Beetlejuice laying on a reclining chair on the beach with a mai tai...LOL! The first Beetlejuice collection reminded me too much of Orly Cosmic FX, but I'm diggin' these. Hopefully they look as amazing on as they do in the bottle. Tropical Sun is the most intriguing to me! Gosh I hope they're half as nice as the picture! I'm specially intrigued by the Indian Ocean. Can't wait! I want Indian Ocean!! I don't think I've seen anything like it. Yet again I shake my fist at you *shakes fist for good measure* I still don't own the last collection. Even with the underwhelming swatches I want them.. Must. Pay. Off. Credit. Card. The orange and blue ones look pretty amazing. I don't know if I'm sold on the colors (even in the promo pics) enough to seek them out, though. Ordering international always becomes a fiasco with my bank, so I try and limit it. Tropical Sun is ridiculously gorgeous in the bottle! I will echo the sentiments of many of the other commenters here, that I hope they translate better to the nail than the previous iteration of the Beetlejuice collection. They are so darn pretty, I can't help but be optimistic! OMG, love the Indian Ocean! I'm really curious about those..
Copper pot looks absolutely beautiful!! Wasn't the last collection rather disappointing in real life? Oh holy crap Copper Pot! Wow! I really love Indian Ocean. I just hope it looks at least somewhat as awesome in real life, as it does in the bottle. But seeing as how they turned out last time, I'm not going to get my hopes up. they look incredible... especially that blue.. drool. These look really fun and interesting. I know I will HAVE to have all of them lol. I really liked the original Beetlejuice collection! Sure, some of them aren't as dramatic on the nail as they are in the bottle (or in the promo pics) but still, they're pretty rad. Love Aqua Violet, Pinky Brown, and Emerald Black (though I wish the "emerald" were a little more intense in that one). Will haaaaave to get all three of these! After last year's collection, which didn't look anywhere near as awesome as the promo pics, I will definitely be holding out for reviews/swatches. The pic looks pretty cool though. Oh how I LOL at the naming of Indian Ocean. The reality of it is so murky and gross. But the colors are beautiful, can't wait to see swatches.